Pictures from forever ago, it feels like. I have even older photos that I have yet to blog, believe it or not. 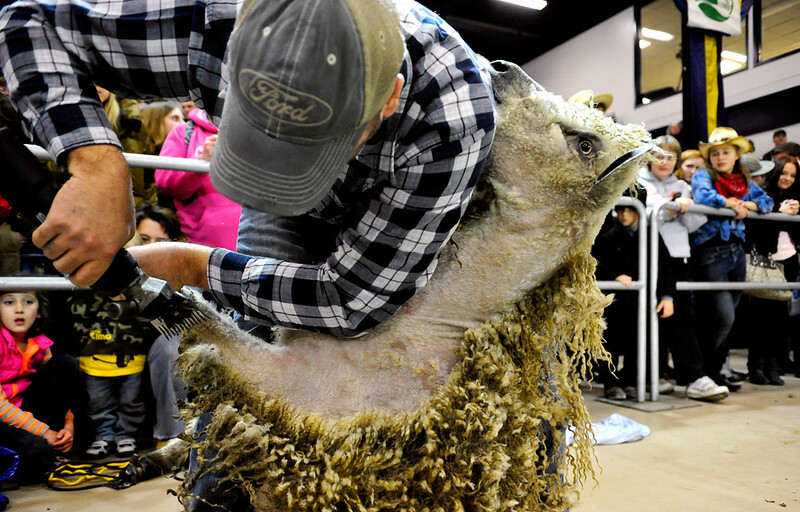 This is the annual Sheep to Shawl contest at the Pennsylvania Farm Show this winter. The name says it all: A team shears a sheep, and then uses the wool to make yarn and weave a shawl, all within two hours. © 2013 by The York Daily Record/Sunday News. Nathan Good of Windsor Township holds up his shears to signal he’s ready to start competing in the 34th Sheep to Shawl Competition on Wednesday, Jan. 9, 2013, at the Pennsylvania Farm Show. Good was a member of the Treadlers thru Time team, whose other members hailed from Lebanon and Lancaster Counties, and whose shawl was not completed in time to be judged. Eight teams of five participated in the 34th Sheep to Shawl Competition on Wednesday, Jan. 9, 2013, at the Pennsylvania Farm Show. © 2013 by The York Daily Record/Sunday News. 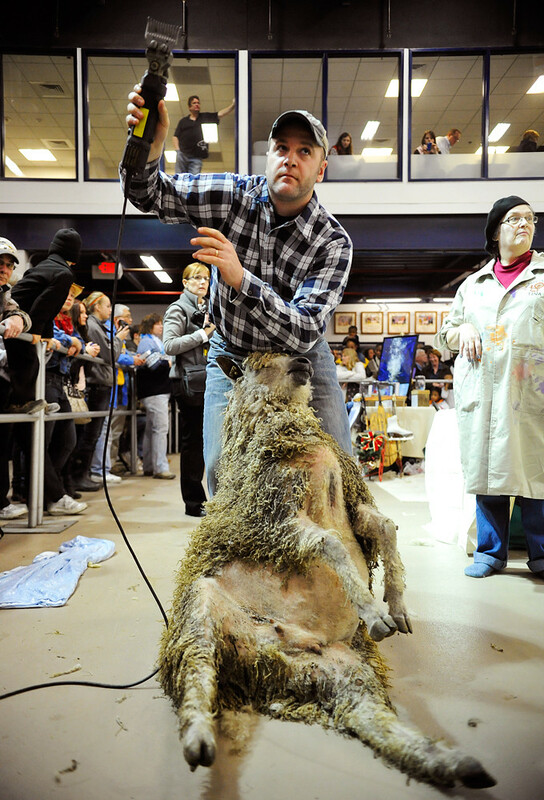 Nathan Good of Windsor Township shears a sheep in the beginning of the 34th Sheep to Shawl Competition on Wednesday, Jan. 9, 2013, at the Pennsylvania Farm Show. © 2013 by The York Daily Record. 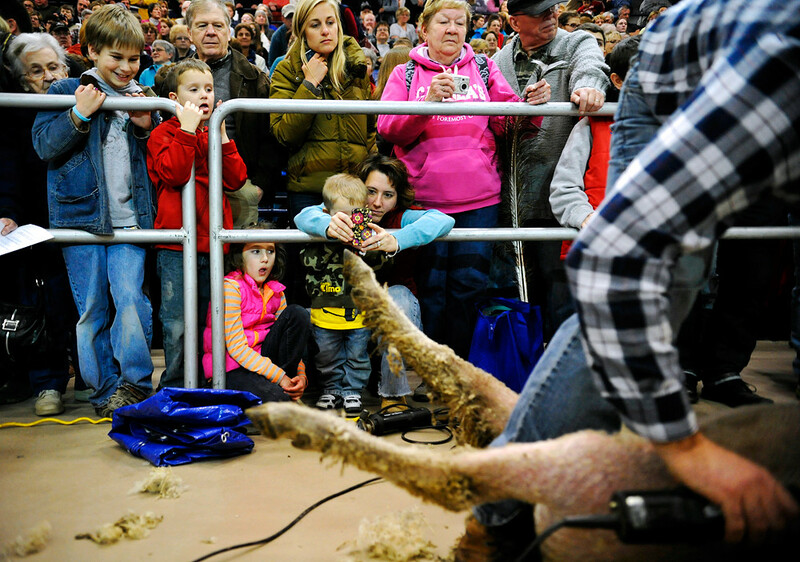 Nathan Good of Windsor Township shears a sheep in the beginning of the 34th Sheep to Shawl Competition as his nephew Mitchell Wise, 11; son Tyler Good, 6; daughter Riley Good, 8; nephew Cameron Hoover, 2; and wife Leanne Good, with phone, watch on Wednesday, Jan. 9, 2013, at the Pennsylvania Farm Show.